Use the Explore tool to leverage the power of queries on your error data. The Explore tool exposes the power of query on your diagnostic data. Useful when you want to group by attributes other than fingerprint and Aggregate attribute information, and when you want to visualize using a List or Flame Graph view. 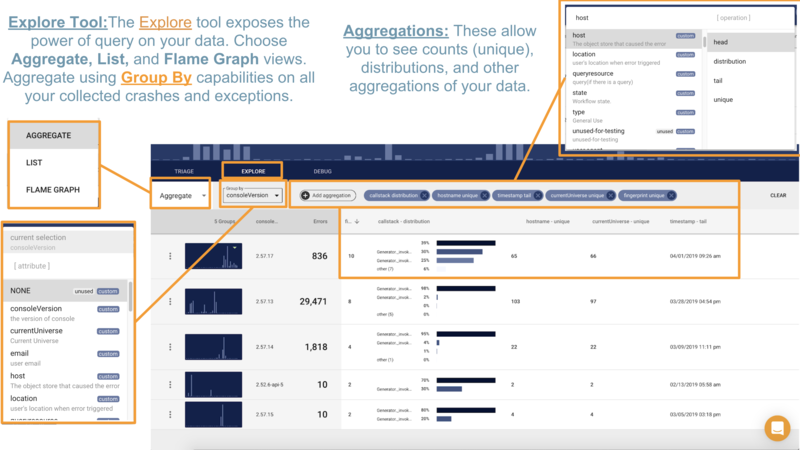 In the image above, you can see how to first choose your view (Aggregate, List, or Flame Graph), and choose any of your attributes to Group By. Typically, users will group by fingerprint, which shows you information about all errors that have been classified by a given fingerprint. The power of Backtrace is fully on display when you begin grouping by other attributes. Group by attribute ConsoleVersion, and then add Aggregates for Call stack distribution, unique number of users impacted, unique number of fingerprints, and the last time one of these crashes occurred. Group by deviceID to see instability by specific hostname . In all of these cases, it becomes useful to add an Aggregate of "Unique Fingerprints" so you can see both a count of individual errors as well as a count of the unique number of issues seen.